Mr. Yamamoto is a very famous art collector in Japan. He is an office worker and he has been collecting art works for 30 years. He usually looks for artwork at art galleries on the weekend. He has about 1300 art works. This time, He is showing 160 works in his collections at the Sato Museum of Art and the exhibition is also holding a talk show “collector and young artist”. Members of the panel are 3 young artists. (an oil painter, a print artist, a Japanese painter) and Mr.Yamamoto and the Sato museum curator. We will discuss “How do I look for and find a collector of my age and How do I find good artists? the panelists will talk about their feelings about art in general. The talk show will help find the kind of artwork you are looking for at an art gallery. I am having the mezzotint workshop at the Gallery Space M in Maebashi Gunma Prefecture Japan. The mezzotint technique makes very beautiful shades of black. 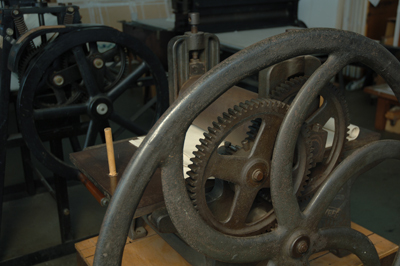 I will bring my press machine and some of my print tools to the Gallery Space M so we can try the mezzotint together. Let’s make an animal dreamworld. It seems difficult to print but it isn’t. The workshop as follows. You use a gummed tape and cardboard to make a print. So, the beginner is welcome. It is very easy because you don’t draw a picture. The workshop uses your hands and body. It's like playing. You can find a new idea from the workshop. Lastly, we will put the prints together so it will look like a wall painting.